Richardson’s Rock Ranch is a family-owned and operated enterprise providing family recreation. Since its opening over 40 years ago, the rock shop hasn’t been closed for a single day. The ranch is a working cattle ranch, supplemented by the world-famous agate beds found on the property, making it a destination for rock lovers from all over the world. Since 1976, they have been the owners and operators of the famous Priday agate beds and thunder egg beds. 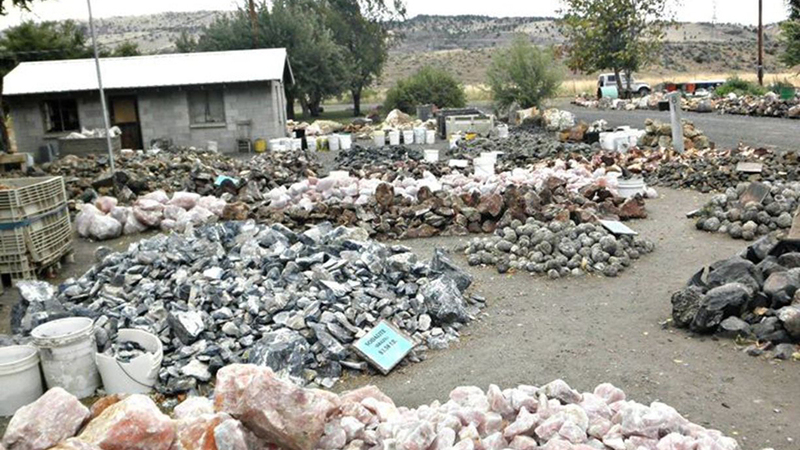 Not only do they have the rock shop with a selection including thunder eggs, moss agate, jasper, jasp-agate, and Oregon sunset, just to name a few, they also allow visitors to dig their own treasures in the agate and thunder egg beds. All of their dig locations are accessible by road, but digging is seasonal and weather permitting, so check in before you head out. They are located approximately 11 miles north of Madras, Oregon, just a few miles east of Highway 97. They will lend you pickaxes and other necessary tools to have a fun time unearthing something special.